While you are in the “currently not collectible” status, the 10-year statute of limitation on tax debt collection continues to run. If the IRS cannot collect the tax you owe within the 10-year statutory period, then your tax debt will expire and you’ll owe nothing to the IRS. A taxpayer facing significant hardships or tax debt burdens should seek the advice of a tax professional specializing in resolving IRS tax debts. At Federal Tax Professionals, we have an excellent track record in resolving collection activity. 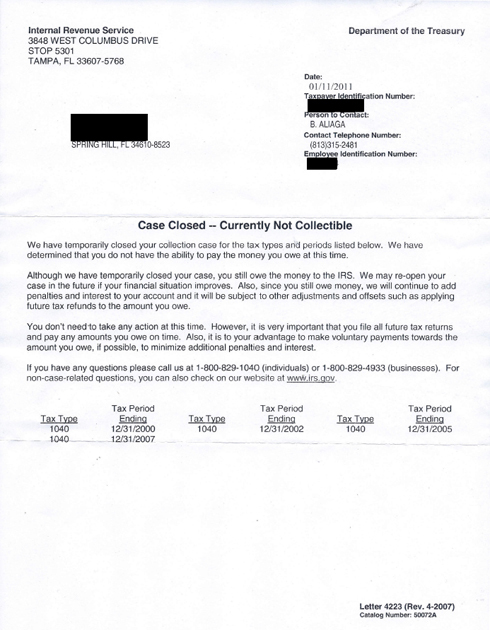 We can negotiate with the IRS for you to have them agree to stop their collection actions. You will not be required to send them any money until you can afford it. Federal Tax Professionals will successfully stop the IRS from sending you those nasty collection letters, and you won’t have to worry about the IRS taking your salary, bank account, car or your home. Thank you for the outstanding work! You have done everything you said you would for us and it all went as you predicted. I am absolutely thrilled at the outcome. Every person in your office that I have had contact with has been there for me every step of the way. They are all professional, helpful and friendly. I’ve had no direct contact with the IRS, as you handled it all. Your group made me feel right at home. They are all pros. Thanks! 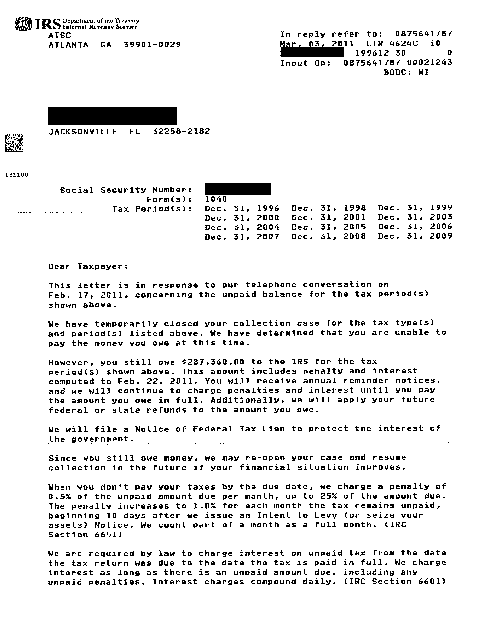 This client came to Federal Tax Professionals with unfiled taxes going back to 1996. Federal Tax Professionals assessed the situation, contacted the IRS, and was able to get the client declared as ‘currently not collectible’ on their $287,360.00 tax debt. This client came to Federal Tax Professionals with unfiled taxes going back to 1996. Federal Tax Professionals assessed the situation, contacted the IRS, and was able to get the client declared as “currently not collectible” on their $287,360.00 tax debt. Although I know I’m not completely out of the woods yet, it sure is a good feeling to have a little sunshine on my face regarding this matter. I would like to extend a very grateful and heartfelt “Thank You” to everyone at Federal Tax Professionals for a job well done.